When a voter arrives at a polling location, the voter will be asked to present one of the seven (7) acceptable forms of photo ID that is current or, for voters aged 18-69, expired no more than four years. Voters aged 70 or older may present one of the seven (7) acceptable forms of photo ID that are expired for any length of time that is otherwise valid. If a voter does not possess one of the seven (7) acceptable forms of photo ID and cannot reasonably obtain one, the voter may present a supporting form of ID and execute a Reasonable Impediment Declaration, noting the voter’s reasonable impediment to obtaining an acceptable form of photo identification, stating that the information contained in the declaration is true, that the voter is the same individual personally appearing at the polling place to sign the declaration, and that the voter faces a reasonable impediment to procuring an acceptable form of photo identification. Election officials are still required by State law to determine whether the voter’s name on the identification provided (acceptable photo ID, or supporting a form of ID, if applicable) matches the name on the official list of registered voters (“OLRV”). After a voter presents their ID, whether it’s an acceptable form of photo ID or a supporting form of ID (if applicable), the election worker will compare it to the OLRV. If the name on the ID matches the name on the list of registered voters, the voter will follow the regular procedures for voting. Reasonable impediments identified on the Reasonable Impediment Declaration include lack of transportation, disability or illness, lack of a birth certificate or other documents needed to obtain acceptable photo ID, work schedule, family responsibilities, lost or stolen ID, or acceptable form of photo ID applied for but not received. You must qualify for one of these reasonable impediments in order to execute a Reasonable Impediment Declaration. A person is subject to prosecution for perjury under Chapter 37, Penal Code, or Section 63.0013 of the Texas Election Code for providing a false statement or false information on a Reasonable Impediment Declaration. The name on the voter’s ID or on the list of registered voters is a customary variation of the voter’s formal name. For example, Bill for William, or Beto for Alberto. Yes. The Election Identification Certificate is now available and will still be a form of acceptable photo ID. 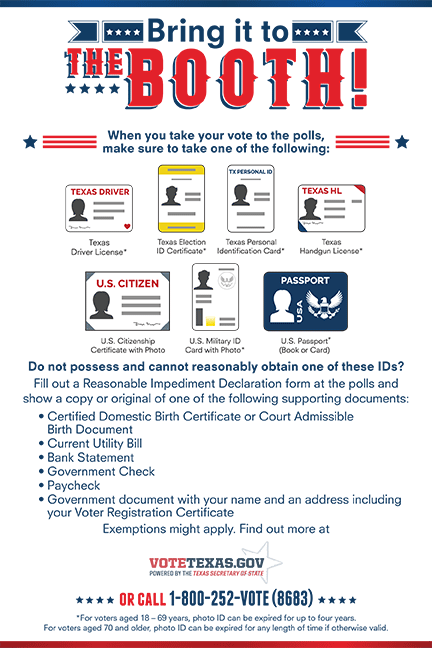 Information regarding how to obtain an election identification certificate can be found at www.dps.texas.gov. You may also contact DPS by telephone at (512) 424-2600 for more information.